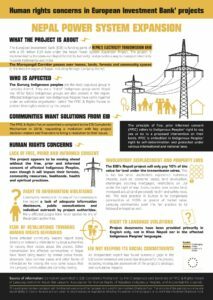 The Lawyers’ Association for Human Rights of Nepalese Indigenous Peoples (LAHURNIP) and Accountability Counsel are supporting communities in the Lamjung district of Nepal who have been affected by a European Investment Bank (EIB) financed high-voltage transmission line, passing over their homes, lands, forests, and community spaces. The EIB is funding the 220 kV Marsyangdi Corridor as part of its nearly 100 million euro Nepal Power System Expansion Project. The Nepal Electricity Authority is implementing the project. It is a major project among numerous existing and proposed power sector projects in Lamjung district, such as the Nyadi and Dordi hydropower projects, and the Chinese implemented 132 kV Bhulbhule Mid-Marsyangdi transmission line. The communities’ main concern is that the project and authorities have failed to take steps to seek local peoples’ free, prior, and informed consent (FPIC), even though community land rights of traditionally governed Indigenous communities are directly implicated by the 220 kV Marsyangdi Corridor, and Indigenous Gurung are the most populous group in Lamjung district. cumulative impact with the other projects in the region. The lack of information disclosure and consultation is in sharp violation of international and domestic requirements to seek FPIC of Indigenous Peoples. Affected communities have organized together under the umbrella organization, the FPIC & Rights Forum, to demand their rights. The communities filed a complaint with the EIB’s Complaints Mechanism requesting a mediation to help resolve their issues with project financiers, promoters and government authorities. Read more about the Complaints Mechanism. 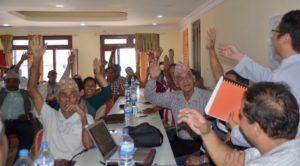 Local communities have come together to demand that development of the hydropower sector in Lamjung respect their rights, including by seeking their free, prior, and informed consent (FPIC) for projects that will affect them and their way of life. FPIC is an international legal standard that applies especially to Indigenous Peoples. FPIC is protected under Nepal’s constitution and under international law, such as the United Nations Declaration on the Rights of Indigenous Peoples (UNDRIP), and International Labour Organization (ILO) Convention 169. Communities in Lamjung district have repeatedly raised their concerns that local hydropower sector projects, including the 220 kV Marsyangdi Corridor, are violating their rights. The FPIC & Rights Forum is an umbrella organization for local-level Struggle Committees of peoples affected by various power sector projects in the region including the EIB funded 220 kV Marsyangdi Corridor. Indigenous and other peoples have coming together as the the FPIC & Rights Forum to work together in solidarity. Many in the group are Gurung, Ghale, Chetri/Brahman, Tamang etc. The traditional leadership of Khasur village, a traditional Indigenous Gurung village represented in the FPIC & Rights Forum, are concerned their traditional forests and lands by the Marsyangdi river will be impacted by the project and its associated facilities. Communities asked LAHURNIP and Accountability Counsel for help to understand the Initial Environmental Examination (IEE) for the Udipur-Markichowk-Bharatpur segment of the 220 kV Marsyangdi Corridor transmission line. As background, the proposed 220 kV Marsyangdi Corridor has been divided into multiple segments: from Manang district to Khudi (in Lamjung district), Khudi to Udipur (in Lamjung district), then from Udipur to Markichowk (in Tanahu district) and Markichowk to Bharatpur (in Chitwan district). The EIB funded Nepal PSEP also includes a line connecting the Marsyangdi Corridor from Markichowk to Kathmandu. Failure to conduct a Strategic Environmental Assessment. At the request of the FPIC & Rights Forum, LAHURNIP and Accountability Counsel sent a letter to the EIB highlighting: salient gaps in the IEE, violations of international and domestic laws and norms, and steps to remedy violations. EIB provided positive preliminary comments, expressing a willingness to engage, but they asked for more time to respond properly to communities’ concerns. LAHURNIP and Accountability Counsel shared the EIB’s response with the communities, who were grateful for the EIB’s positive tone. The communities asked us to send a follow up letter to the EIB. Since the project is moving ahead regardless, communities are concerned violations of their rights will further crystallize. As a result, the FPIC & Rights Forum have now raised their issues by filing a complaint to the Complaints Mechanism, which is a part of the European Union’s accountability framework for the bank. Lawyers’ Association for Human Rights of Nepalese Indigenous Peoples (LAHURNIP): LAHURNIP is a Kathmandu (Nepal) based civil society organization of Indigenous lawyers. LAHRUNIP provides free legal aid services and work to promote, protect, and defend the human rights of Indigenous peoples in Nepal. Environmental Law Alliance Worldwide (ELAW): ELAW is a global alliance of attorneys, scientists, and other advocates collaborating across borders to promote grassroots efforts to build a sustainable, just future. The communities filed a complaint with the Complaints Mechanisms, the European Investment Bank’s independent watchdog and mediation office in Luxembourg. LAHURNIP and Accountability Counsel sent a constructive follow up letter to the EIB, at the request of communities. EIB provided preliminary comments, expressing a willingness to engage, but they asked for more time to respond properly to communities’ concerns. LAHURNIP and Accountability Counsel shared the letter with communities. At the request of the FPIC & Rights Forum, LAHURNIP and Accountability sent a letter to the EIB. The letter introduces EIB management to the FPIC & Rights Forum in Lamjung and describes violations of international and domestic law in the implementation of the 220 kV Marsyangdi Corridor. The letter encloses and summarises ELAW’s report, which finds deficiencies in the environmental and social assessment process for the project, and offers suggestions to move forward, including requesting a halt on the project until FPIC is secured from local communities. The FPIC & Rights Forum requested LAHURNIP for legal and advocacy support to engage with the EIB and relevant authorities. LAHURNIP invited Accountability Counsel to partner on matters related to advocacy with the EIB. The Lamjung, Nepal based grassroots community group, FPIC & Rights Forum invited LAHURNIP and Accountability Counsel to provide information about the European Investment Bank (EIB) funded 220 kV Marsyangdi Corridor transmission line project, and opportunities to engage with the EIB. Accountability Counsel has started supporting communities on this case since March 2018. 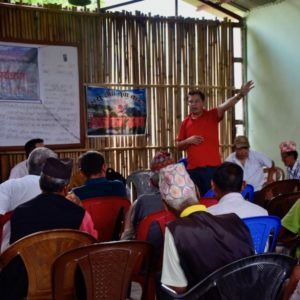 We have worked closely with our local partner, LAHURNIP, to accompany the FPIC and Rights Forum – a community grassroots group of and for peoples affected by various hydropower sector projects in Lamjung district – in their pursuit of justice. Coordinating an independent scientific assessment of the project’s environmental and social documentation. Our partner, Counterbalance, developed this infographic about the case which was shared with EIB board members and senior management.